Let’s talk about stress…it happens to all of us. Every one of us has their own stressors, big or small. The key is finding healthy ways to relieve that stress so it doesn’t interfere with your health goals. Because when you feel anxious, your levels of the stress hormone cortisol spike, and cortisol can slow your metabolism, raise your blood sugar, and weaken your immune system. I gotchu though ~ you can reduce your stress and cortisol levels naturally through your MHW lifestyle. That’s why I love meditating, doing yoga, getting 7.5-8 hours of sleep a night, and giving my body clean, nutrient dense meals from the Milk and Honey Wellness Complete Nutrition Plan to help stay relaxed and balanced. There’s also been a lot of buzz lately about some ancient foods called “adaptogens” that can naturally help your body cope with stress. You may have heard about them so I want to give you all the details. Adaptogens are herbs, roots, and mushrooms that help you adapt to stressful situations (that’s where they get their name). They can also boost your mood and brainpower. You can use these in smoothies, coffees, or even chocolate to balance stress hormones and feel like a Zen goddess! 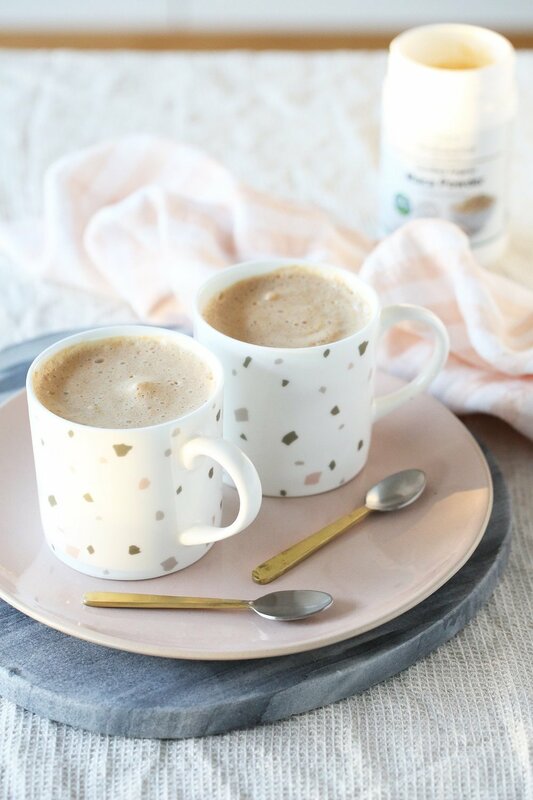 I'm breaking down four popular adaptogens and everything you need to know! How to use it: I like adding a teaspoon to my morning or afternoon smoothie, stirring it into an almond yogurt, or mixing it into a Protein Pancake. Ashwagandha is an herb traditionally used in Ayurvedic medicine to help decrease stress levels and balance thyroid hormones. One study found that 300mg of Ashwagandha taken twice a day helps decrease the stress hormone cortisol.³ Lowering your cortisol levels can rev your metabolism too! How to use it: You can find herbal supplements using Ashwagandha at most health food stores. There are also delicious chocolates with Ashwagandha at health food stores. Just make sure you choose a chocolate that has at least 70% cacao. This is great as a dessert 1-2 times a week. Chaga is a mushroom that’s often used in coffee or tea. Chronic stress can put the body in an inflammatory state and lead to achy muscles and joints, making it harder to recover from a workout. Chaga mushrooms are extremely high in antioxidants that help lower that inflammation. It’s actually one of the most potent antioxidant foods! How to use it: Chaga is usually one of the main mushrooms found in mushroom coffees and teas. 1. EFFECT OF THREE DIFFERENT CULTIVARS; BMC Complementary and Alternative Medicines. 2. SPORE POWDER OF GANODERMA LUCIDUM; eCAM. 3. STUDY OF SAFETY AND EFFICACY OF A HIGH-CONCENTRATION FULL-SPECTRUM EXTRACT OF ASHWAGANDHA; Indian Journal of Psychological Medicine. Want even more info on how to treat your body right? Join the Milk and Honey Wellness REVIVIFY Complete Nutrition Plan! It’s packed with science-backed information on what to eat, when to eat it, and WHY! Plus, you get 8 weeks of recipes and meal plans! Take all the guesswork out of your nutrition and just enjoy the green smoothie ride! What is your favorite adaptogen and how do you use it? Share with us in the comments below!